Perched atop cliffs overlooking aqua Caribbean waters, Tulum, which flourished between the 12th-16th centuries, was once a major center of trade for the ancient Mayan world. Today, its ruins are an enticing draw for cruise passengers who want to explore ashore during a port call at Cozumel or Playa del Carmen, Mexico. 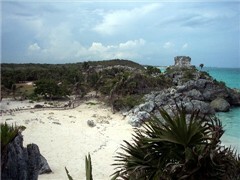 SouthernCruising.com visited Tulum on a recent cruise. Explore via your armchair with our original photos. Cruising to Cozumel? Looking for something fun to do on the island? What if you've been there before? 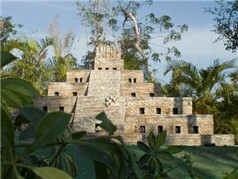 In 2007, a new attraction, the Discover Mexico Park,opened on Cozumel. It's designed to give visitors a sense of Mexican history and culture. Set in a rainforest environment, it features replicas of many of Mexico's most recognized tourism sites, as well as a themed Mexican marketplace. So if you're headed to Cozumel, check out this new attraction.